592 pages | 30 B/W Illus. 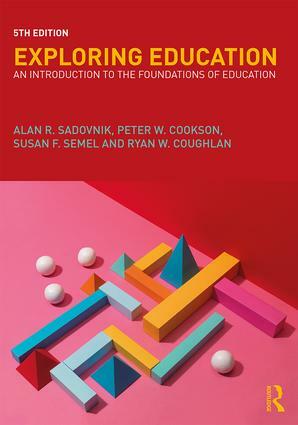 This much-anticipated fifth edition of Exploring Education offers an alternative to traditional foundations texts by combining a point-of-view analysis with primary source readings. Pre- and in-service teachers will find a solid introduction to the foundations disciplines -- history, philosophy, politics, and sociology of education -- and their application to educational issues, including school organization and teaching, curriculum and pedagogic practices, education and inequality, and school reform and improvement. This edition features substantive updates, including additions to the discussion of neo-liberal educational policy, recent debates about teacher diversity, updated data and research, and new selections of historical and contemporary readings. At a time when foundations of education are marginalized in many teacher education programs and teacher education reform pushes scripted approaches to curriculum and instruction, Exploring Education helps teachers to think critically about the "what" and "why" behind the most pressing issues in contemporary education. What Is Philosophy of Education? What Do the Schools Teach? The Effects of the Curriculum: What is Learned in Schools? Education and Inequality: Mobility or Reproduction? Alan R. Sadovnik is Board of Governors Distinguised Service Professor of Education, Sociology, and Public Administration and Affairs at Rutgers University-Newark, USA. Peter W. Cookson, Jr. is a Senior Researcher at the Learning Policy Institute Palo Alto California and Washington DC, and teaches in the Sociology Department at Georgetown University, USA. Susan F. Semel is Professor of Education at the City College of New York, USA and Professor of Urban Education at the City University of New York Graduate Center, USA. Ryan W. Coughlan is Assistant Professor of Sociology at Guttman Community College, CUNY, USA.